State Street Ballet brings together its professional dancers, students of Gustafson Dance, and Opera San Luis Obispo Grand Orchestra to perform the holiday classic in Santa Barbara style. 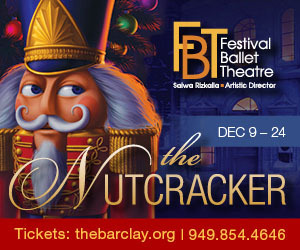 Compete with opulent sets, a gigantic Christmas tree, and The Granada Theatre's period-perfect architecture, this production is a family-favorite. With sets, costumes, and staging that capture the Slavic history of the ballet, it's a richly beautiful performance that delights audiences of all ages!